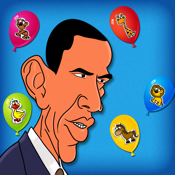 Fun game to that helps babies learn names of animals with the quiz master himself Barack Obama. The animals float in beautiful balloons of different and attractive colors. Kids are asked to pop the correct balloon by touching it. When a balloon is popped, they get the popping sound as feedback, and the balloon explodes into bits. Kids are rewarded with stars for getting the right answer. ● Beautiful balloons of different colors. ● 7 beautiful backgrounds made for kids. ● Backgrounds are randomly selected so your kids play longer. ● Barack Obama's voice indicating which animal to touch.